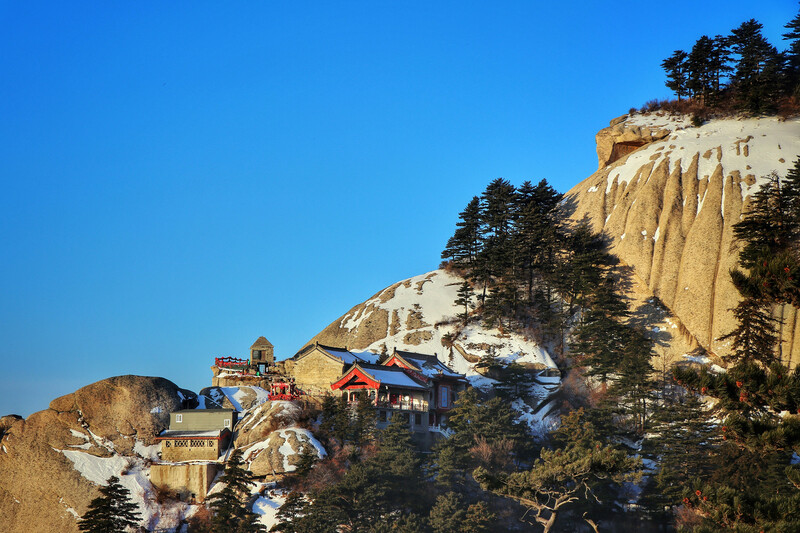 Located in the Shaanxi Province of China is the lovely Hua Shan City, also known as Huayin. 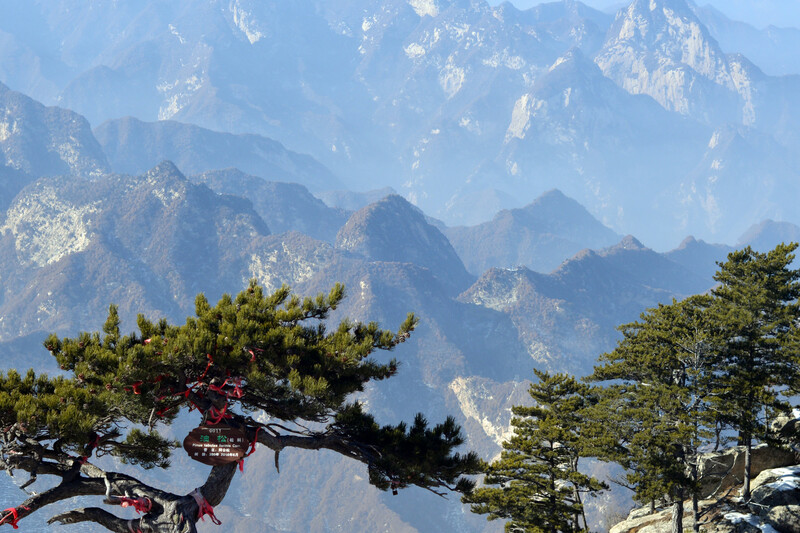 Although it is almost 120Kms from Xi’an, the provincial capital, it is a popular tourist destination due to its proximity to Hua Shan (Mount Hua) Scenic Area. The region has a splendid landscape of tall peaks, dense forests, narrow and steep natural trails and trekking paths, crags, cliffs, and valleys. 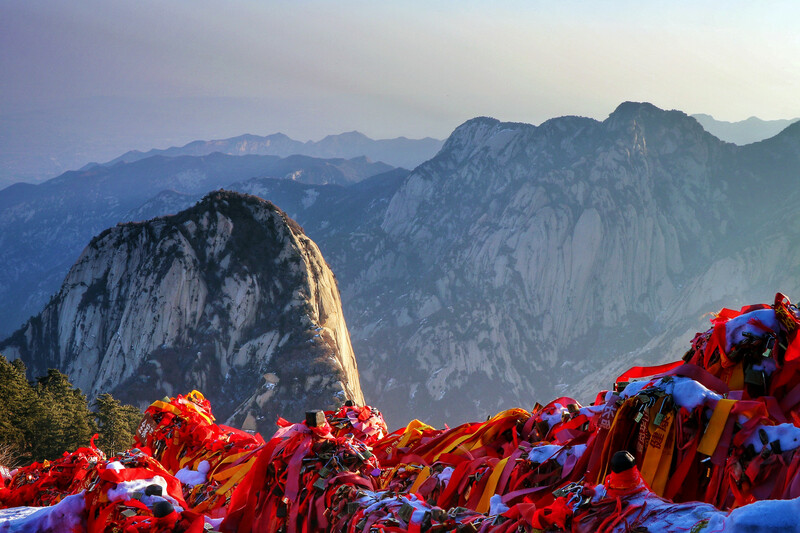 Mount Hua actually consists of five peaks, each having its own scenic vista that attracts tourists. 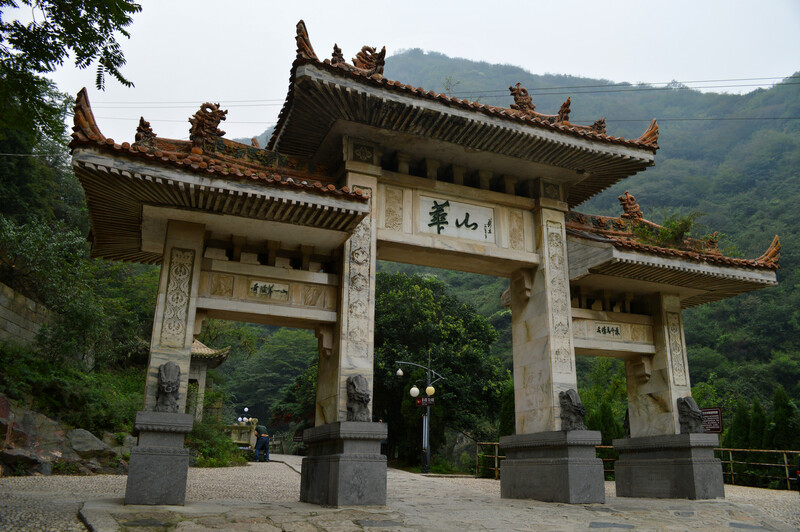 Built during the reign of the Northern Song Dynasty, the Jade Spring Temple is a relic of the past that functions as a Taoist temple even today. The temple was actually constructed in honor of Chen Tuan, a respected scholar of the time. 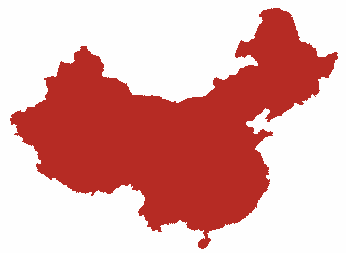 The followed religious ideologies that were a pleasant combination of Taoism, Buddhism, Quietism, and Confucianism and established a neo-Confucianism school of thought. There are several other ancient relics around the city that have become part of the regular tourist circuit. 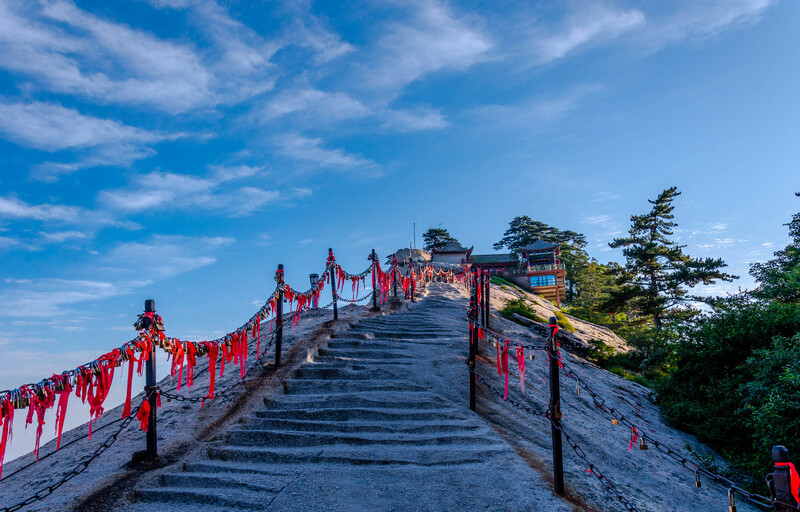 As far as modern pursuits in Hua Shan City are concerned, hiking and trekking are the most popular activities that tourists like to indulge in besides just sightseeing. 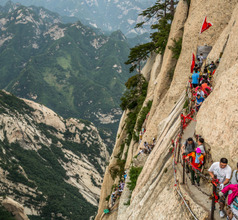 Mount Hua has several dangerous and very dangerous paths along the precipitous peaks that serious hikers love to ascend as a challenge. The most perilous ones are the Thousand Food Precipice, Sparrow Flipping-Over Plank Road, and the Hundred Food Precipice. Hikers have to obtain passes to attempt these planks. 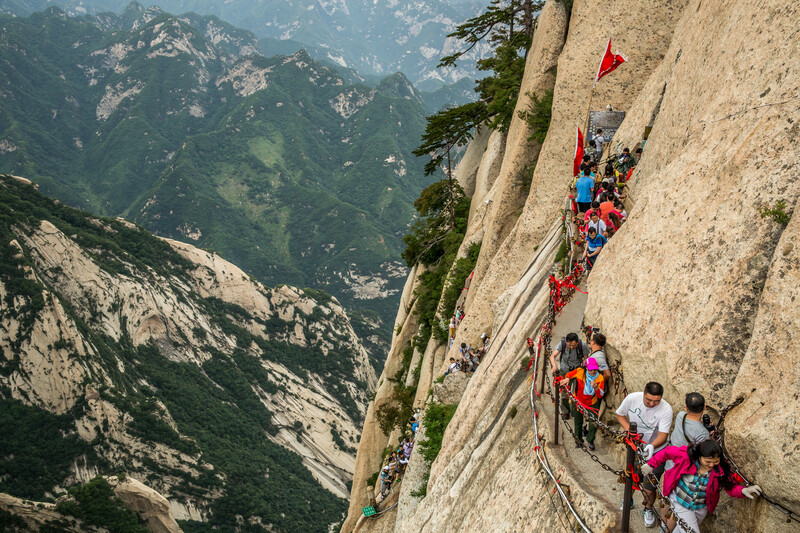 Note: It is best to avoid Chinese holidays because the paths can be crowded and accidents can occur. Also, it is advisable to carry a flashlight and a walking stick. 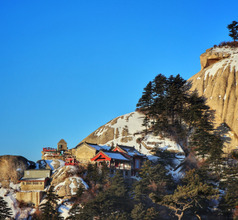 Tourists have a wide choice in accommodation in Hua Shan. 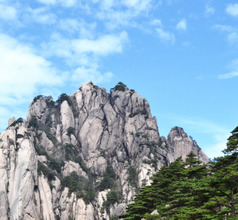 There are hotels in downtown Hua Shan (Huayin) at the foothills of Mount Hua as well as on the upper slopes. The resorts on the slopes have wonderful views compared to the once in the city below but they also have premium tariffs, especially in the peak tourist season between April and October. Also, the resorts on top get booked faster than the once at the foothills. 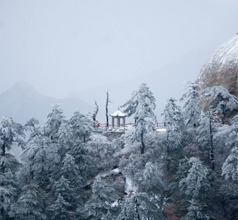 There are star hotels, boutique hill resorts, mid-range hotels, with various amenities as per their star rating. There are also a few guesthouses or inns where cheaper accommodation with limited amenities is available. 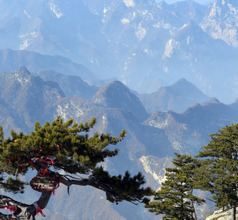 The Hua Shan Scenic Area is wild, abundant, thriving, spectacular, and awe-inspiring. 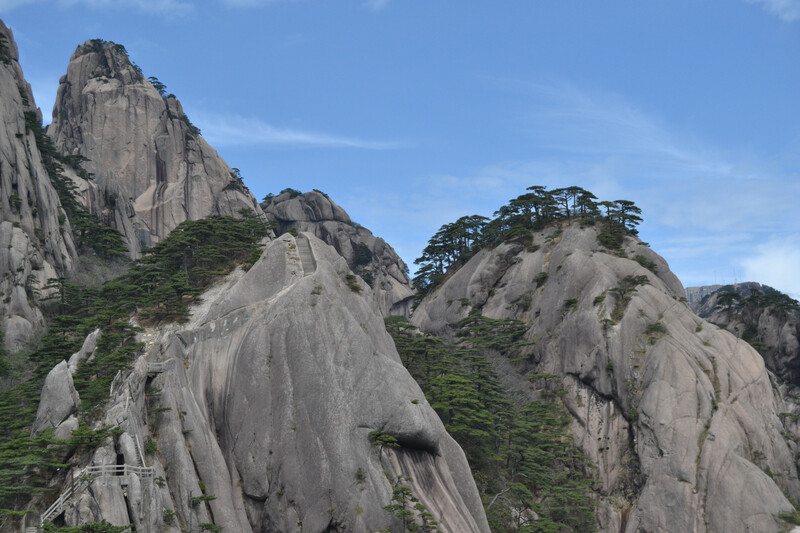 The five peaks of Hua Shan are a delight for naturalists, tourists, botanists, and especially for photographers. 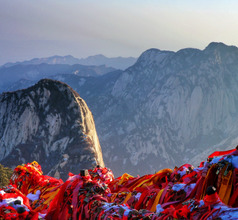 The sunrise at the East Peak is a brilliant sight. 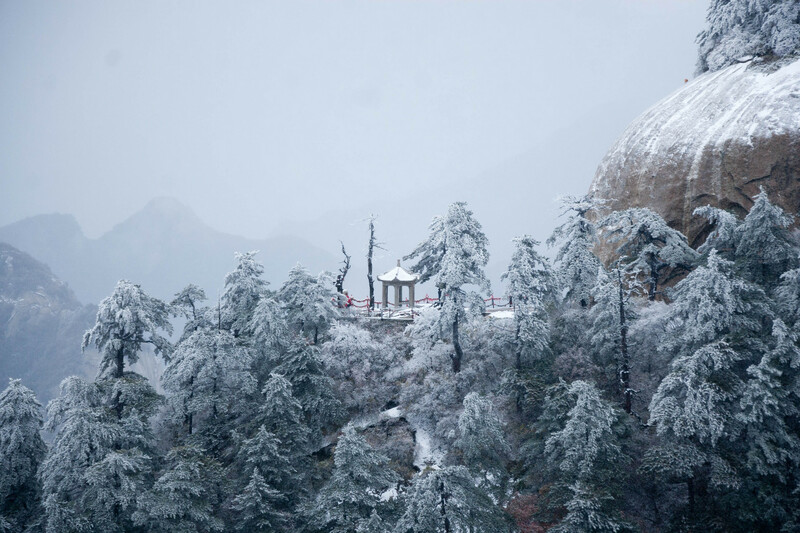 The South Peak at 2160 meters above sea level is known for its height and steepness. 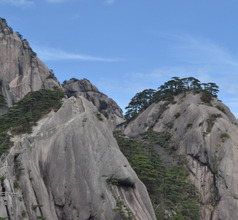 The West Peak is smooth and complements the South Peak. 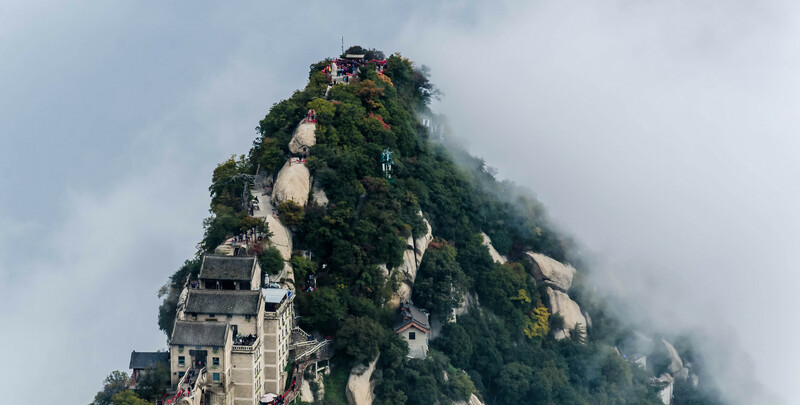 The North Peak is better known as the Cloud Terrace Peak because it has a natural viewing platform that lends a panoramic view of the scenic area. 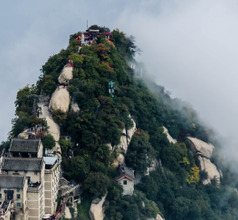 And the Middle Peak is called the Jade Lady Peak due to its dense foliage. 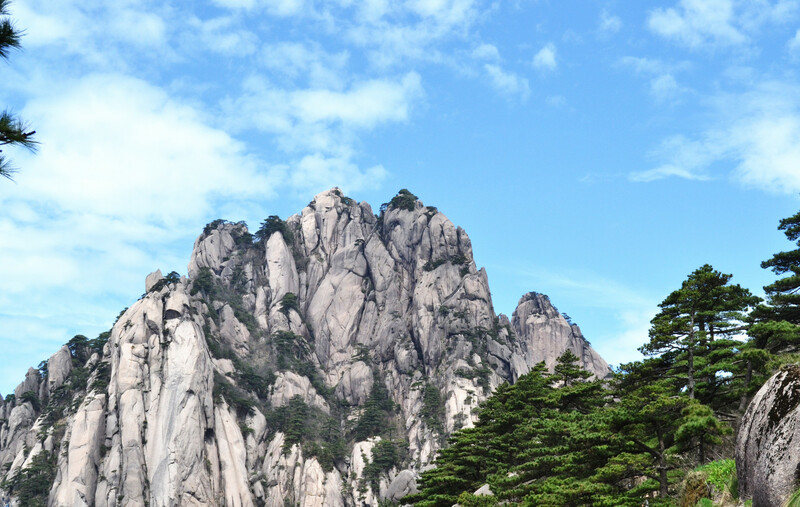 Collectively, the five peaks have several attractions like the Lao Jun Li Gou, Golden Lock Pass, Yao Zi Fan Shen, Xianyu Area, Changkong Plank Road, Black Dragon Ridge, Bai Chi Xia, etc. 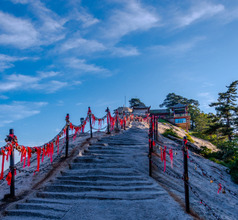 There are also 20 Taoist temples or more in the Hua Shan Scenic Area. 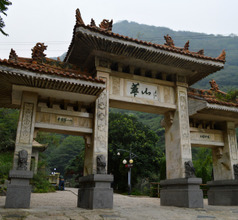 Those that have remained in excellent condition even today are the West Sacred Temple Area, Cuiyun Palace, Dongdao Courtyard, Baidi Temple (also called Jintian Palace), Yuquan Garden, and Zhenyue Hall which are considered among the top Taoist temples in China along with the Jade Spring Temple. The cuisine of Shaanxi Province influenced by the salty flavors of the adjoining Shanxi Province and the spiciness and sourness of Sichuan. Pork and lamb are commonly used in their dishes along with sticky rice of flatbread made from wheat. The locals love grilled and barbequed meat which is a popular item in upscale restaurants as well as in the night-market food stalls. Some of the local delicacies are flatbread with mutton soup, mutton kebabs (barbequed meat on skewers, pomegranate juice, meat burger, cold noodles, steamed meat with wheat powder, dumplings in hot and sour soup, Biangbiang noodles, cake made with sticky rice dates, etc.